Two things really stand out in this album for me. One, Jorge Ben's voice. It's all over the map: high, low, manic, depressed, etc. If anything, the one thing that's consistent throughout is its uniqueness. Second, is his incorporation of samba sounds with rock, and more importantly, funk. 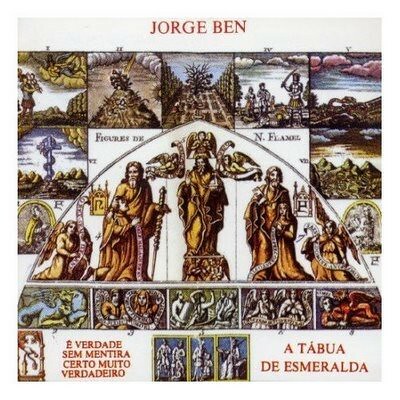 The sound that Jorge Ben helped to invent along with other notable Brazilian musicians out of the Tropicalia movement was in reality another Bossa Nova, a movement that built upon the old sounds of samba within the framework of a different decade: the late 60s and 70s. With that being said, there are also elements of psychedelic influences, including experimentation with more complex instrumentation that was fairly common (sometimes unfortunately) among artists of this part of the decade. On some tracks you can even find musical and lyrical nods to Ben's historic African roots, not surprising considering two years later he would release an album titled Africa Brasil. According to Rolling Stone, this is the best album ever produced in Brazil. While that position might be debatable, it's significance and overall quality shouldn't be. This album's foundation, like A Tábua..., is samba. Throughout the album you can hear the cavaquinho, a small ukelele like guitar often used in Samba. The percussion also borrows significantly from its Samba roots. The difference between this album, however, and A Tábua... is that Acabou Chorare fuses its Samba foundation with a different sound: hard rock with more clearly psychedelic elements. The most interesting track is "Mistério do Planeta" which in a way represents the musical progression found in the album. Starting off with a simple samba-esque guitar line, the song eventually progresses to an electric guitar riff that sounds much more early 70s. The album itself was produced in 1972. Since when has Spanish not been Latin...... Those are some interesting (and pretty diverse) examples though, Andres Sergovia is pretty good. Appreciated; I thought it was an interesting range as well. I laughed out loud, actually. Enjoying the range of all the work. That's whats great about the themed weeks. And some new ideas while I was working! Well, one great one I missed. What a duo these two make. They beat their hands UP on those strings. I do love their work, but it takes a little bit of an occasion to bring them out... and I don't know why. I'm glad I had a chance to listen to them today, because of this thread. Wow ! You guys really know your way around Latin music. I enjoyed your Mexican Institute of Sound and Mattias clips, Mrd00d, for their very original take on cumbia and la Bamba, but for repeated listening, I think I`d go back to the beautiful Sergovia song more often. I`m no real fan of Ranchero as such, and most Mexican kids treat it as a joke: it`s over-exposed in the local media and turns up in the soundtrack of too many cheesy old Mexican movies. I think Shakira, Mana or Enrique Iglesias are about as Latin as most young people want to go; cumbia,samba,bossa nova, etc are strictly for the grandmothers and housemaids. The gradual developement in your Novos Baianos clip is excellent, BTW and your Jorge Ben recommendation reminds me that I`ve got a track of his on a sampler album I`ve hardly ever played, so I`ve got some listening to do. And there`s Mrd00d with another post - slow down, you guys ! A very cool song I think. This has to be one of the catchiest guitar riffs ever..I really cant hear a heavy dose of latin style in this particular song. Just enough that I can still manage to listen to it all the way through. Still a great song that I had forgot about until I saw this thread. Carlos Santana never got mentioned. yeah I'm surprised he didn't get mentioned and I should have also mentioned him as much as I listen to his material. The expression "Latin music" seems to be too vague. I use to say, as a joke, that I imagine Julius Caesar playing the electric guitar, Cicero rocking the bass and Octavian at the drums. (...) what I suggest is that we use this week to simply celebrate what we think of as latin flavoured music which we enjoy, whatever genre might better describe it. There's a lot of Latin folk that's really under-appreciated in my opinion. I agree. I mentioned the great tradition of folk singer-songwriters at the Spanish-language music thread. I especially like Víctor Jara from Chile. Yes, Andrés Segovia was a wonderful guitarist. BTW, Asturias was originally composed for piano by Isaac Albéniz (see MB thread). Albéniz's works have many influences from traditional Spanish music. As you can hear, he has incorporated the influences from both Argentinian (tango) and Spanish popular music. I love that song! Way too under-listened in the U.S. though, people only really think of Girl from Ipanema when they hear Bossa Nova and it's a shame, considering Jobim did so many other good songs. I once went to an anniversary concert in honor of Jobim and saw Gal Costa, Oscar Castro Neves among others perform all his great hits. It was a pretty amazing show. I was definitely a fan of that video, mostly for the boobies I must admit.